I lately have this fascination with french macaroons. They are so pretty, so good and did you know they are so EASY to make! Although mine are not the prettiest, they are definitely really tasty! 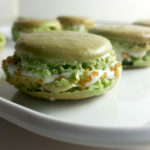 I made some this green with gold speckled french macaroon cookies recipe in celebration of St. Patrick’s Day this month! 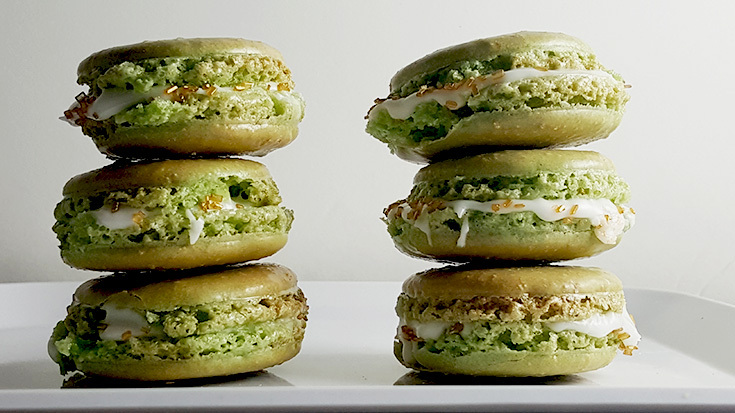 If you love macaroons but have never made them, I dare you to give it a try. What is fun about these cookies is that you have the option to make them whatever color you want. You can then give them whatever flavor you want. 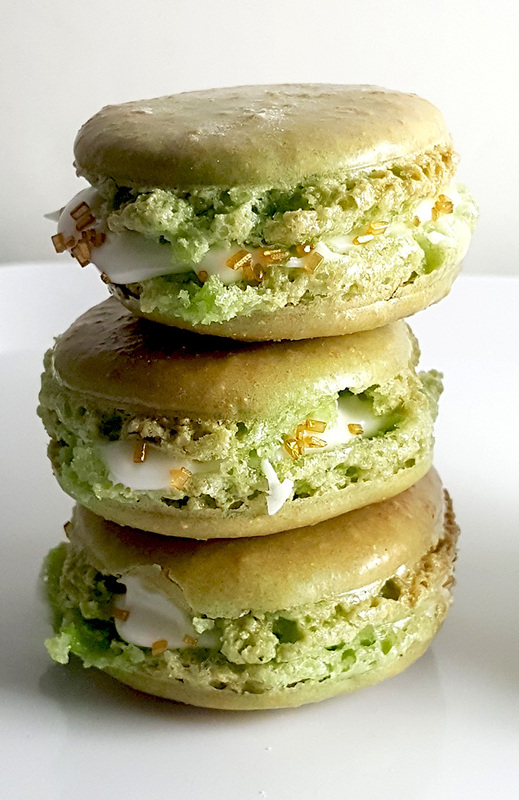 Then you can put whatever filling inside to create your own delicious macaroons you can enjoy all for yourself or share with your friends that will think you are quite the baker! In a large bowl sift the almond flour and powdered sugar. Set aside. In a mixing bowl add egg whites, cream of tartar and salt on medium speed until frothy. Gradually add the granulated sugar and continue to beat mixture until stiff and shiny. Add the egg white mixture to the bowl with the almond flour. Using a spatula, fold in egg whites, giving your bowl a quarter turn with every fold. Add food coloring gel, almond extract and vanilla extract and continue folding and turning, making sure sure to scrape the mixture down the side of the bowl until batter is smooth and falls off your spatula. Pour your batter in a pastry bag that is fitted with a 1/4-inch round tip. Hold your pastry bag vertically and pipe 1 1/4 inch circles on your baking sheet. Once done piping, tap the baking sheets twice against your counter to help release air bubbles. I prefer to use a silicon mat on top of my baking sheet. I also use a macaroon template under my mat when I am piping to make sure they are the same size. Let the baking sheets sit on the counter at room temperature until the tops are no longer sticky to the touch.Wait at least 15 minutes to 1 hour to allow your cookies to become the right texture. Bake at 300° for 20 minutes. Remove from oven and transfer to a cooling rack. Peel the cookies off the rack and make a sandwich using a filling of your choice. Find a variety of filling recipes here.